Ninety kilometres south of Fortaleza, the tiny village of Uruaú is famous for its 24-hour blowing wind! The wind is perfect for riders learning new tricks, improving their skills or beginners wanting to progress. Even though Uruaú is a tiny village, it has everything you'll need as it is close enough to Fortaleza but free from any city stresses! The fact that you are at a wave spot, as well as a flat water lagoon, make it worth a visit altogether; you can choose what you are in the mood for! The season here is from July until January and Uruaú offer perfect wind during those months. It's boardshorts/bikini weather during the day (even on the water), and then it cools down just a little in the evening to have the perfect goodnights sleep! The kite sizes mostly needed here are 9m and 12m kites for men and 7m and 10m kites for women. There is a massive white sandy beach for you to set up your kite on in front of the Pro Kite Centre and the staff over there are always happy to help you launch and land your kite. Another advantage in Uruaú is, you don't need to worry about where to go kitesurfing, the spot's right there! All the accommodation and restaurants are 2-5 minutes walk from the spot. As Uruaú is just a little town, the options are a little bit limited when it comes to food choices. The main meals you will easily find will generally be a choice of good meat, seafood (crayfish, lobster, shrimps), pizzas, hamburger, fruits/vegetables can be bought from the store and of course the famous Brazilian Acai! Because Uruaú is mainly focussed on kitesurfing and training, there aren't really any parties going on daily unless it's a special occasion (there is a little bar for that) If you are in the mood to party, then you would get a taxi to Canoa Quebrada which has an enjoyable Reggae bar on the beach. Option number two would be to head to Fortaleza and that would be a proper night out in the city. In Uruaú, 2 -3 times a week the kite centres will organize a dinner somewhere with their guests. 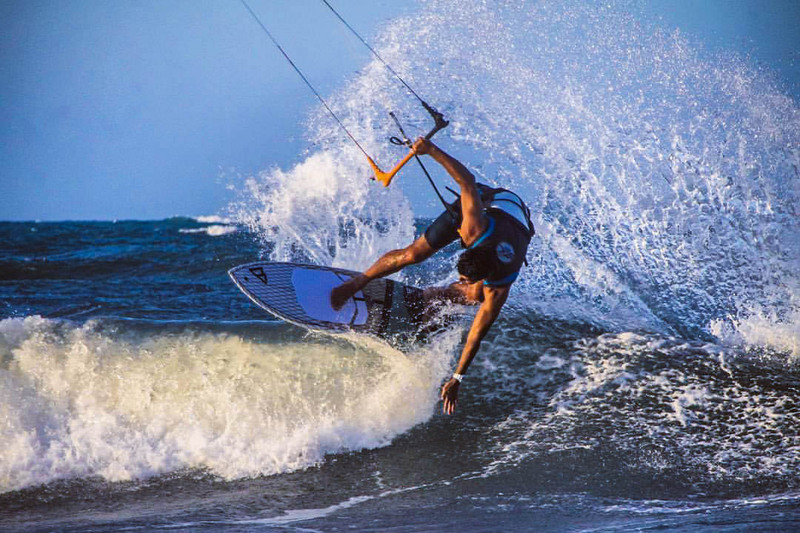 The full moon party at Kite Pro Brazil is a night you do not want to miss, this starts with a BBQ around 6-7 PM and as the moon slowly illuminates the beach everyone goes for a Full Moon kitesurfing session. It is rare to hear that phrase around here, but if it should happen - everybody heads to the spa to relax. They are secretly relieved that they are obligated to take a day off the water and rest! Many people enjoy the buggy trips to visit the fisherman's villages or to the dunes, where you can go sand-boarding and explore Brazil's gorgeous nature. If you enjoy horse-riding, you want to go for a sunset ride on the beach; you will not regret it! You'll have wifi at the kitesurfing centres as well as the accommodation. Italian/American Jen Tyler grew up in the chaos of Cairo, Egypt. It was on the beaches of the Red Sea where her love for the ocean, water sports and adventure grew. Jen previously managed Element Watersports, El Gouna but now she focusses her time on her love for kitesurfing, traveling and writing for IKSURF Magazine! Been to Uruaú? What did you think? Where are the Best Kitesurfing Beaches in Uruaú? This super flat lagoon is where most of the pro riders coming to train. It can get quite busy at times, but everyone gets into the rotations system, everyone respects each other and that way everyone has enough space to practice! But if you want the lagoon for you alone, this is possible as well for sure in the morning (where usually nobody goes, because the wind is 24 hours) or over lunchtime. The sea in front has some small waves. Nice to go big or perfect to start with wave kiteboarding (with or without straps). When is the Best Time to go Kitesurfing in Uruaú? Do you know a good kitesurfing school here? Submit it below.